Imposters? Louisiana iris impersonators? Too harsh perhaps, and probably the wrong connotation. The real problem is not with the plants but with the level of knowledge about them. Given a dearth of horticultural information, almost any plant can be misidentified. After all, even where it grows wild in South Louisiana wetlands, "ditch lily" is one of the local names often applied to the unique native Iris giganticaerulea. Hardly accurate and certainly insufficient respect for the "State Wildflower." The most frequent cases of mistaken iris identity undoubtedly vary by area of the country. This page is shaped by experience in South Louisiana, where a number of popular iris types are not often found. For example, Bearded irises are not commonly grown and Siberian irises are very rarely seen. Consequently, both types generally escape being fodder for error. Others are not so lucky. If it looks like an iris and is growing in Louisiana, shouldn't it be a Louisiana iris? Unfortunately, not always. 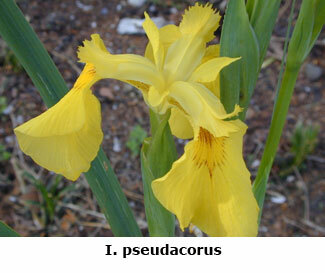 The most frequent and aggressive imposter is the common yellow flag, Iris pseudacorus, a European transplant and not a native. "Why don't my yellow Louisiana irises bloom?" is an all-to-common question from gardeners seeking advice on growing Louisiana irises. Invariably what they have is the yellow form of pseudacorus. Pseudacorus blooms more reliably in water, but often puzzles and frustrates those who have them in their garden. It's not just a local error, either. 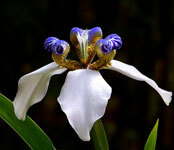 Do a Google or eBay search for "Louisiana iris" and look through the images. You will find yellow flag imposters among the real things. Pseudacorus is not the only culprit. There are a number of others irises or iris cousins that invite a case of mistaken identity. Iris virginica is sometimes mistaken for a Louisiana iris, but it at least is native with a range that significantly ovelaps that of Louisiana irises. It also likes similar boggy conditions and in some places can be found growing in the vicinity of Louisiana species in the wild. Virginica is a nice plant, worthy of garden culture, but just not closely related to Louisiana irises. Ironically, it is a closer relative of pseudacorus, exhibiting the same midrib in the leaf that Louisianas lack. But virginica is a better citizen than pseudacorus, and will not crowd out its neighbors in the garden. You may happen across the YouTube clip about Giant Blue Native Irises and Yellow Flag Irises. The yellow flag shown is indeed pseudacorus, but the lead close-up picture is not a Giant Blue, a term usually reserved for the tall Louisiana species I. giganticaerulea. 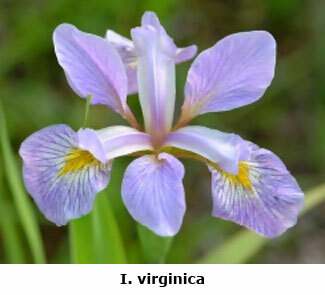 Rather, it is a virginica. Virginica almost always is a much shorter plant and would never be mistaken for giganticaerulea based on stature. 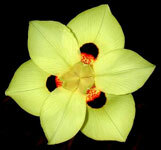 There is a passing similarity in the flowers but with distinctive differences. These are familiar plants, related to irises but not actually in the Genus Iris. 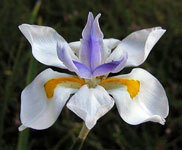 Dietes and Neomarica are genuses in the Family Iricidicae, and thus related to true irises. The flowers share the same six petal structure and blade-like leaves as irises and understandably enjoy such common names as Butterfly Iris (Dietes) and Walking Iris (Neomarica). 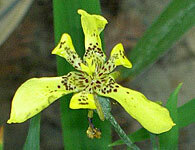 The flowers are distincly smaller than most irises, however, around two inches across. The available forms are nice plants and rightfully enjoy a place in many gardens. Dietes and Neomarica are natives of the Southern Hemisphere. All true irises, all two hundred or so species, hail from the Northern Hemisphere. A logical question, not unheard of but a real stumper, is one such as this: "What's the difference between a Louisiana iris and a Japanese iris?" It's is a real challenge to know where start on that one. What's the difference between a Ford and a Toyota? Same problem. Louisiana irises and Japanese irises are classified as "beardless." Siberians, Spurias, Pacific Coast Natives, and several others (including the virginicas) are also beardless irises. As might be expected, there are certain similarities among all beardless irises. Many of the more telling differences relate to other characteristics than the flower, such as the shape of leaves, growth habit of their rhizomes, color range, and climate and soil tolerance. But, there is so much variation in flower form within each group that it is impossible to show just one or two pictures that are representative. Given the pictures selected, it would be very easy to confuse a given Louisiana with a Japanese iris, for example, but over a range of pictures the common patterns and distinguishing features would become clearer. A better alternative than a handful of pictures is a little research project. This site is a good place to start on Louisianas, but point your browser to Google and a wealth of information on irises of almost all types can easily be found. The American Iris Society has a good starter page on beardless irises. And the beardless irises are a relative few among the two hundred-plus iris species worldwide. If you want to get deeper into the amazing variety of irises, check out the website of SIGNA, the Species Iris Group of North America.